IWRG (Black Terry) vs Dr. Cerebro trainees. Angel Oriental replaced Black Dragon. Mascara Magica Jr. is also listed on the Cerebro side but no one was removed (9v8?) Match came down to Diablo Jr. and Moto Cross, with Mascaira Magica getting back involved and unmasking Diablo for the DQ. Mascara Magica Jr. is a noteworthy trainee name. Eddie Guerrero was originally Mascara Magica. The one who followed him in CMLL I thought I heard was living in Texas, so it’s odd his son would be training Mexico City. Tonight’s the second of three Fridays with CMLL & AAA shows streaming live. CMLL will have the first part of it’s annual incredible pairs tournament from Arena Mexico, while AAA is running it’s first normal TV taping of the year in Toluca. Both have strange things going on with their main events. 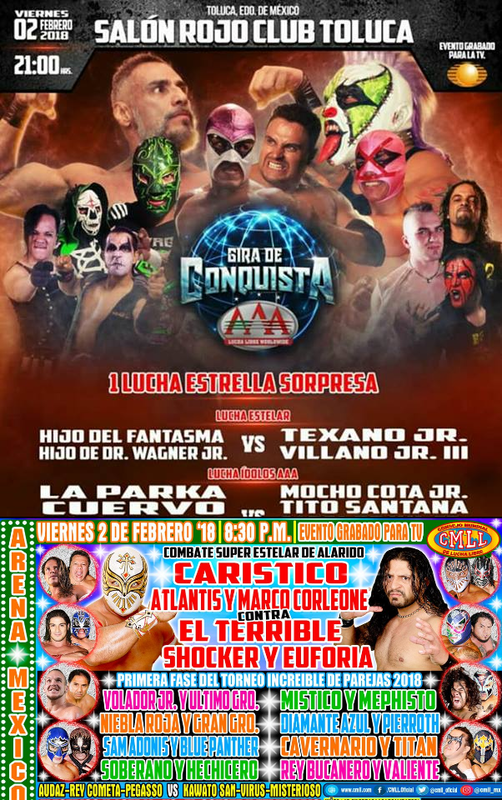 CMLL’s main event was scheduled to be Atlantis, Caristico and Marco Corleone versus Terrible, Shocker and Euforia, the meaningless main event to send people home after a long tournament show. Maybe it would set up something with some of these guys being partners next week. CMLL instead changed the card on Thursday, with Angel de Oro (in for Marco) and Cuatrero & Sanson (in for Shocker & Terrible). Oro & Cuatrero have been feuding since being in Japan, and were running into each other even before hand, and is the only rivalry CMLL’s pushing strongly at the moment. It would be almost exactly as big a surprise for them to end up being the Homenaje a Dos Leyendas main event as it was with Niebla Roja & Gran Guerrero, but CMLL did run Niebla Roja & Gran Guerrero. There has to be a reason for them being in the main event; they’re not in the practice of using Friday shows to build up Tuesday matches. The vast majority of the show will be turned over to tournament lucha, never a great thing. CMLL’s made strides at improving this format over the last couple of years. It still will be a lot of short matches, where some people will be pinned with moves that usual don’t beat them, and matches with one side forcing their usually spots in and accidentally making it obvious they’re about to be eliminated in the process. This tournament also suffers from an unbalanced format: there’s Ultimo Guerrero & Volador, the top rudo and tecnico in the promotion, and there’s 15 other teams. It would be a upset for them to lose at any point, and a huge one for them to lose tonight. Mephisto & Mistico win a bunch, Niebla Roja & Gran Guerrero were the anniversary main event and main evented a show on Fantasticamania, and it’d still be a surprise if either of them make thru. The remaining teams – Soberano/Hechicero, Blue Panther/Sam Adonis, Pierroth/DIamante Azul, Cavernario/Titan and Rey Bucanero/Valiente – are all just hoping to be the one of the bunch isn’t eliminated in the first round. Diamante Azul & Pierroth (MedioTiempo, +LuchaTV) and Soberano & Hechicero (MedioTiempo, +LuchaTV) did press promoting the shows. Neither has a great chance of winning; Azul was sniping at Pierroth and told Ovaciones that he feel he needs to lose about 10KG to be in prime shape. Soberano & Hechicero are billed as dark horses and would be interesting finalists if CMLL wanted to throw out a different main event. Blue Panther called Sam Adonis a loud mouth, so I don’t like their odds of getting along. The segunda might be the match which draws the most Twitter attention tonight. Kawato San will debut, teaming with Virus & Misterioso against Audaz, Pegasso and Rey Cometa. Virus & Audaz were rivals last week and probably will be this week, which means Kawato will mostly wrestle either Pegasso or Cometa. The show opens with Electrico & Astral out of the minis division but right back in the openers, taking on Templario & Coyote. Despite the position, that could be a good math. CultIcon previews the show. It will air on Claro & Facebook at 8:30 and will be up on YouTube later. Kawato made his CMLL debut on a Facebook live chat yesterday. CMLL is holding a contest to win tickets to the H2L press conference. I can’t recall them doing this before, and it mostly involved posting photos proving your fandom on Instagram. 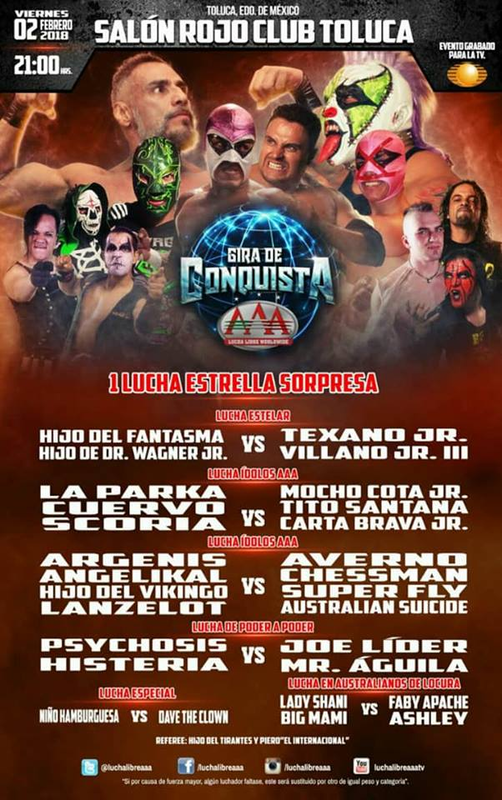 AAA runs tonight in Toluca, at 9pm. This is the official launch of AAA’s Twitch channel. The stream should be 24/7 after this show. One suggestion I neglected to take myself: if you can, sign up for a (free) Twitch account – it seems like you get less post match commercials if you’re logged in. If you use Amazon and have one of those accounts (especially if you’re on Prime), that may help as well. The main event of the show is a mystery. It’s an intended one: AAA broke from tradition and listed the main event as a surprise match. They later confirmed Dr. Wagner & Psycho Clown would be in it, while saying it would not be another 1v1 match versus them. A Toluca news site, probably with information from the local promoter, reported the match will be Wagner vs Psycho vs Vampiro. AAA has said nothing – they want it to be a surprise, whatever it is. I think that triangle match is most likely, but I wouldn’t take it for 100% certain either – they may have planned to leak out one thing and change, or change it along the way. There’s a bunch of matches on this show. None really jump out as must see; this is not last week’s Guerra de Titanes and shouldn’t be compared to that standard. The semimain has Texano & Villano III Jr. vs Fantasma & Hijo del Dr. Wagner Jr., a match which looked like the feuding veterans teaming with young guys for one night, and now is just a little weird with Wagner turning last week. Poder del Norte face Cuervo, Scoria and La Parka, a battle between the current trios and tag team champions. OGT team up with Australian Suicide against the combination of Angelika, Argenis, Hijo del Vikingo and Lanzleot. The last two are scheduled to meet next week in a cruiserweight title match. The Vipers, Histeria & Psicosis, take on Joe Lider & Mr. Aguila in a battle of rudo teams. Nino Hamburugesa faces Dave the Clown in a match that will be a struggle. The show is scheduled to open with Big Mami & Lady Shani versus Ashley & Faby Apache. Given Shani & Apache are now in a mask versus hair match, perhaps that’ll be moved later. If AAA’s really set on making Faby a ruda, they should make her team with Ashley permanent and just have Faby be cruel to her sympathetic apprentice all the time. That absolutely seemed to work for Impact not too long ago. Guerra de Titanes was (and still is) available to watch on VOD, so I’m sure this show will be as well. This is really just a normal TV taping, and I find myself more intrigued by what they’ll start airing afterwards. “Historical videos and never before seen material” sounds like the best possible scenario for this service. It also sounds like it must’ve been a lot of work. Zona Ruda covered Guerra de Titanes with Australian Suicide as guest. Lady Shani wants to dispel the notion she’s just a pretty woman who’s not really good at wrestling by defeating Faby Apache. The Gladiatores has a sit down interview with Hijo del Dr. Wagner about his turn. Since this wasn’t on AAA show, I’m not sure if they’ll stick with any reason. Arena Aficion had a surprise Perros del Mal member, and it was actually a surprise. Ek Balam, the bodyguard figure in the group who went without a name for a long time, showed up there in the semifinal. He’s only had a handful of matches in the last few years and wouldn’t be a big deal if he was advertised, though now I wonder if he was meant to be the guy in previous occasions. The Crash announced Nicho Psicosis as the first wrestler on it’s WrestleCon weekend show. Dragon Rojo, still out with an injury, wants people to help name his dropkick off the ramp to the floor. If I were him and hurt, I would come up with a new move that didn’t involve doing a dropkick off the ramp to the floor and ask for a name for that instead. A brief article on the Lucha Libre Incluyente show tomorrow in Morelia, There’s a wrestler from Scotland named The Mime wrestling on the show. Another one focuses on San Luis Potosi luchador Dark Conde. Lucha Sorpresa picks the best matches of January. LuchaWorld has the latest lucha news update, including Kaho Kobayashi revealing on Informa that she’s in CMLL for three months. The new episode of Lucha Talk talks about Guerra de Titanes & FantasticaMania. Segunda Caida reviews Lucha Underground season 3 episode 28. Rey Bucanero’s school has moved to a new location. I remember hearing the previous building was damaged in the earthquake, not sure if that’s what led to the move. Violento Jack & Aeroboy were interviewed by their local paper. An interview with Peru’s Reptil. Angel de Oro & Cuatrero meet prior to CMLL’s H2L press conference. Kawato is working a lot right away. Panther & Okumura was set up by a foul last week. One non-title CMLL singles match is odd, two is extraordinary.